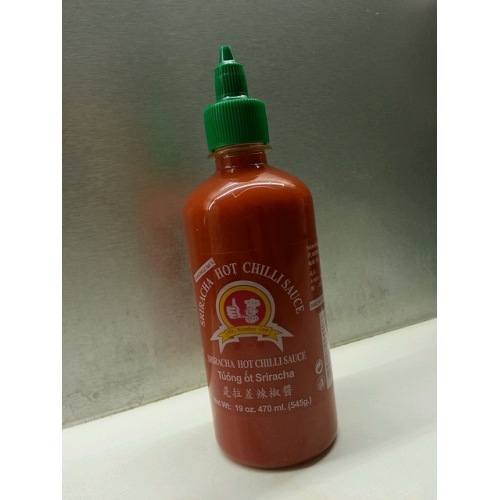 Sriracha Thai Hot Chilli Sauce. 300ml. Home > Spices > Sriracha Thai Hot Chilli Sauce. 300ml. Sriracha is a type of hot sauce or chili saucemade from a paste of chili peppers, distilled vinegar, garlic, sugar, and salt. It is named after the coastal city of Si Racha, in Chonburi Province of Eastern Thailand, where it was possibly first produced for dishes served at local seafood restaurants. In Thailand, sriracha is frequently used as a dipping sauce, particularly for seafood. In Vietnamese cuisine, sriracha appears as a condiment for phở, fried noodles, a topping for spring rolls (chả giò), and in sauces. Sriracha sauce is also eaten on soup, eggs and burgers. Jams, lollipops, and cocktails have all been made using the sauce, and sriracha-flavored potato chips have been marketed.